It has a 5.2-liter V-10 engine that packs 610 horsepower and 413 lb-ft of torque. Those specs are an increase of 70 hp and 15 lb-ft over the regular model. With its seven-speed dual clutch transmission 0-62 mph time is 3.3 seconds and has a top speed of 203.8 mph. Its the fastest convertible in the world. Rumors are that the initial line of deliveries were delayed in California as the cars were held in customs for being too fast….We hope that story is true. It has no bad angles. This review will not cover the technology of Audi’s virtual cockpit…trust us, its awesome! It will not cover the minimal luggage space….No one buys this car for luggage space! This review will not drone on about every made up problem we can find…it has none! There is a scene in the movie Young Guns II, where Emilio Estevez, as Billy the Kid, confronts someone with a quick draw of his pistol and utters, “Ill make you famous.” That’s the R8 Spyder. You’ll be famous as it makes you a better driver than you really are, and because it makes everyone look good, you’ll be famous while riding around inside of it. It shares the DNA of Audi’s GT racing cars, because the Spyder and R8 Coupe are built at Audi’s Böllinger Höfe production site, where they also make the Audi R8 LMS and, in the future, the Audi R8 LMS GT4 as well. 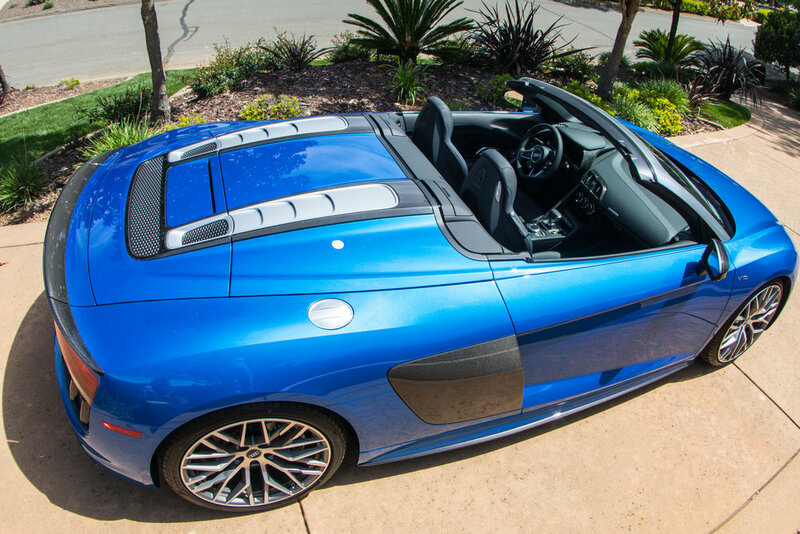 The R8 Spyder isn’t a sleeper that flies under the radar. It goes as fast as it looks, maybe faster. When seeing it for the first time it lives up to the excitement that gets built up knowing you get to take it for a drive. The Spyder V10 plus doesn’t have a V10 plus badge to denote that it's special. 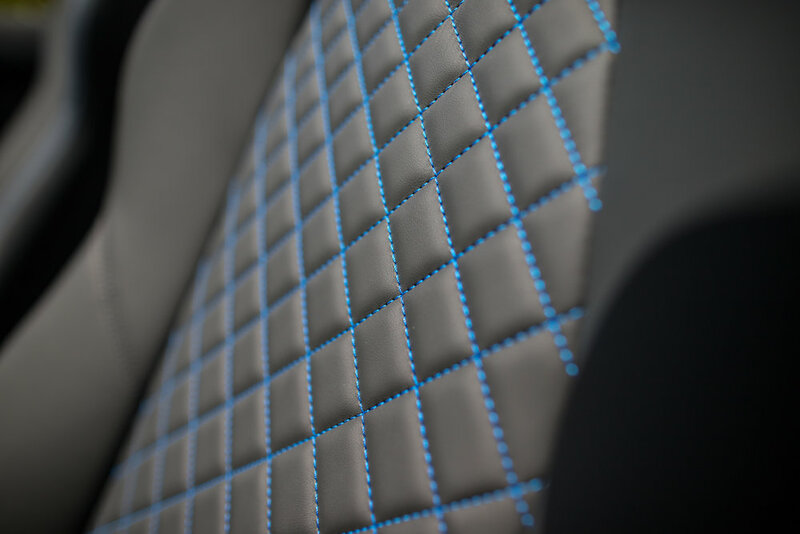 Rather, a look at the fine touches on the body work reveal accents such as a carbon fiber rear spoiler and carbon fiber trim pieces both inside and outside the car. It looks the part of a racer disguised as a legal road going car. Carbon ceramic brakes are standard and the brake rotors look as big as the tires on an SUV. 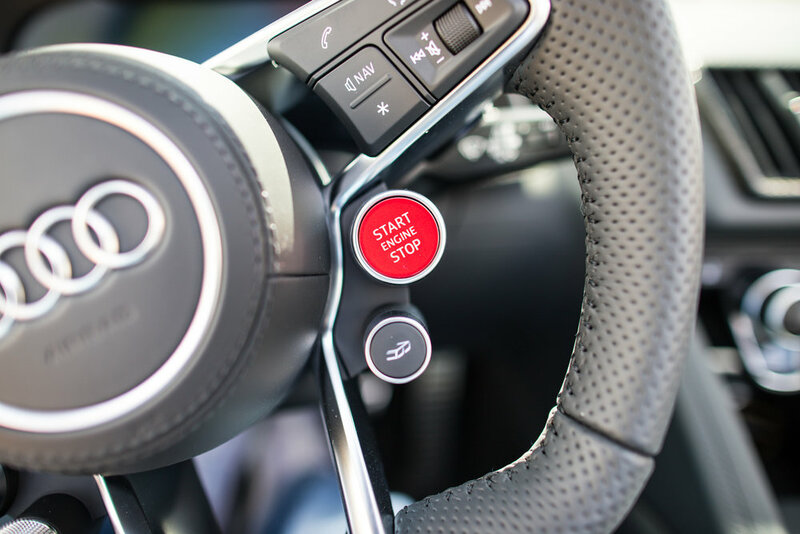 The real fun begins when the top drops, dynamic mode is engaged and the little exhaust noise selection button is depressed on the steering wheel. This combination allows one to hear the snarls and growls of the V10 Jabberwock behind the cockpit. The noise, oh that noise! 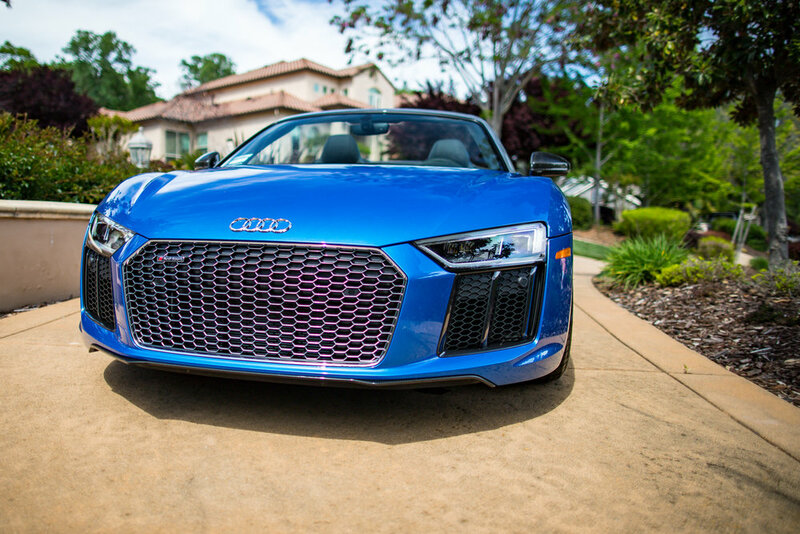 The speed and precision of the R8 Spyder put it in a league above many others, but the sound of the snarling V10 makes the throttle pedal the purveyor of instant joy. Going off throttle after some exuberant acceleration brings about pops, barks and gurgles that only make the dumb grin larger and larger. 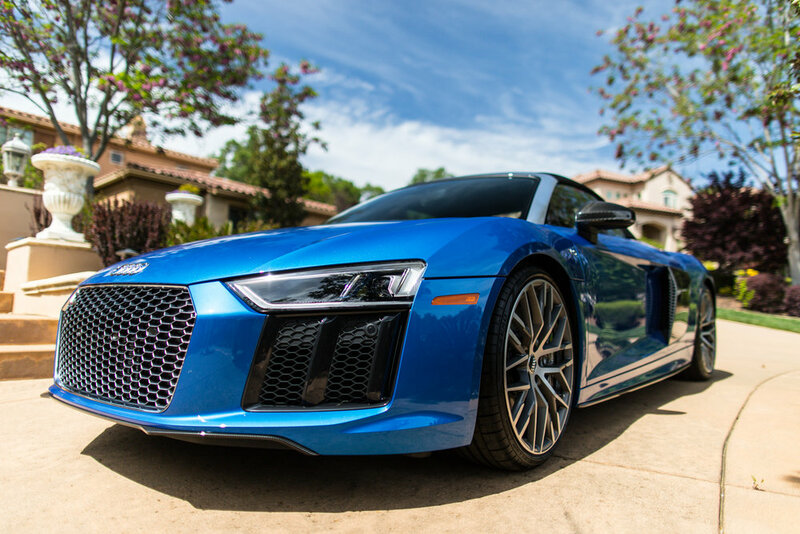 Even with the noise and Millennium Falcon like speed, the R8 Spyder is always stable and confident on the road. Audi’s Quattro system, race car inspired suspension and Dynamic driving setting come together to make the car feel as if it's on rails. 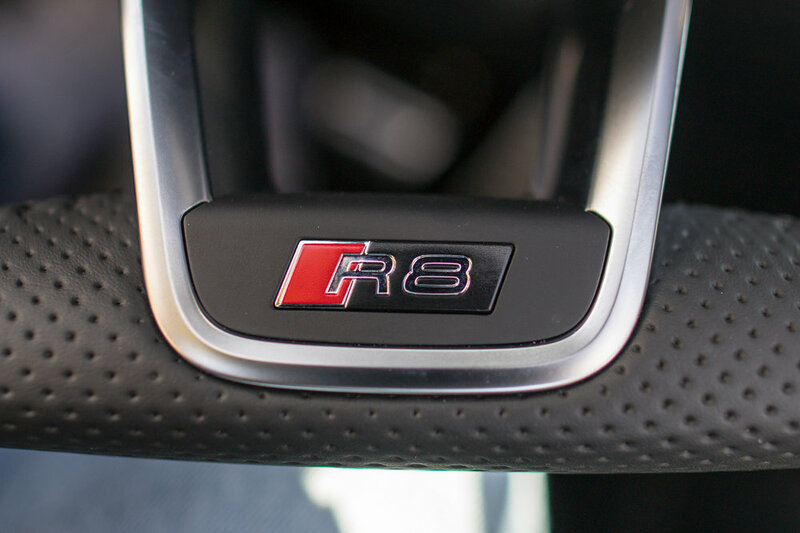 From foot to the floor brutality to cruising around in traffic, the R8 always has razor sharp stability that responds to anything you ask of it, building the driver’s confidence and at the same time probably making the average driver appear to have more skill than they really do. We are Cleared for Takeoff. Often, the choice for the open top version of a beastly sports car result in compromises of form over function. The R8 Spyder turns this upside down as not only is it not a compromise, but the ability to have all that noise right behind your head with nothing but the open air above is a bonus, not a hindrance. The normally aspirated V10 is fading away. 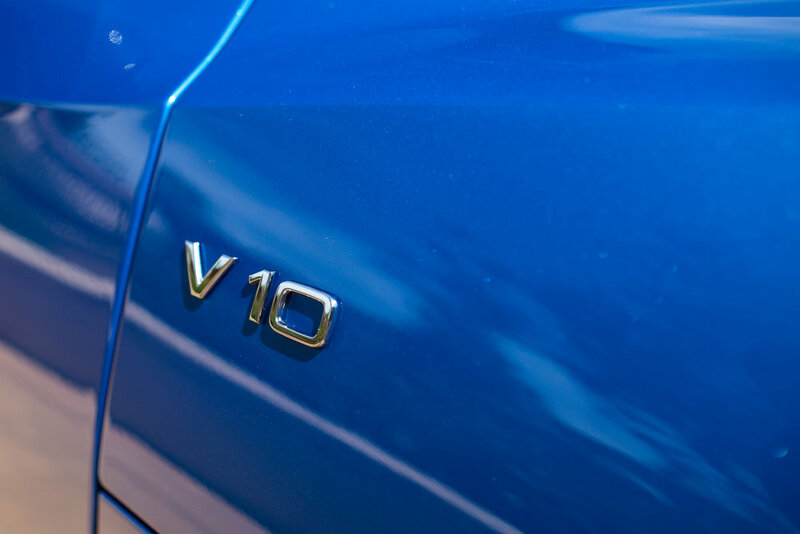 With Audi announcing the Spyder as the last of the breed, it is likely that the V10 disappears from the Audi lineup completely as they move closer to EV and hybrid technology for future models. 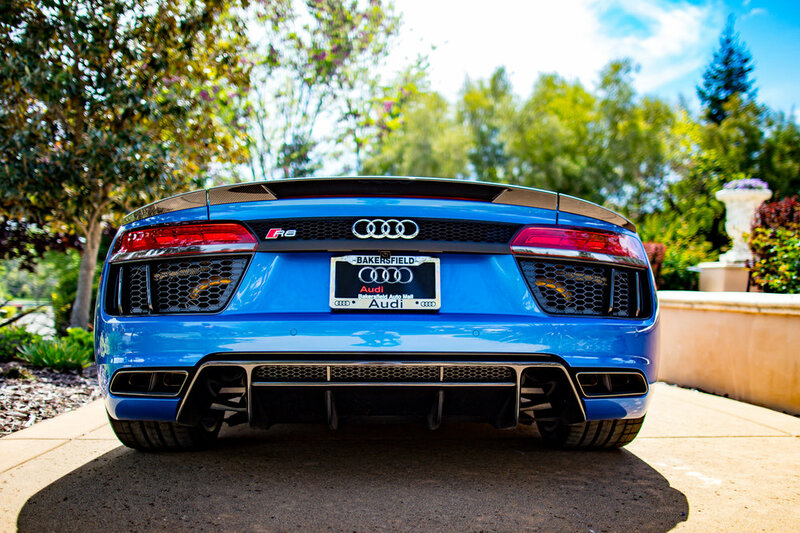 The Spyder V10 Plus is a colossus, flexing its muscle for all to see and signaling to the competition that Audi has reached its peak and has nothing left give in the R8 line.